Finishing touch. 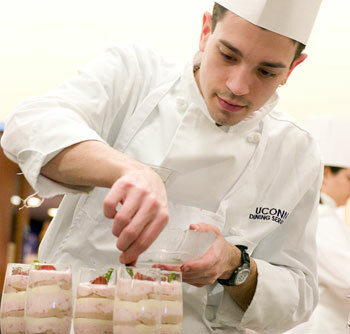 Chef James Watt of the South Campus dining hall prepares Napoleon Cheesecake Mousse during the sixth annual Culinary Competition, held at Putnam Refectory Jan. 13. Watt’s specialty dessert took first prize in the recipe contest. This year’s event was covered by the Food Channel. The more money the alcohol industry spends on advertising, the more young people drink, according to a new UConn study published in the Jan. 3 issue of the Archives of Pediatric and Adolescent Medicine. The governance of the School of Medicine has recently been reorganized, with six specialized groups replacing two general governance committees. Martha Louise Hinkel, former dean of women and assistant dean for residential students affairs, died Jan. 9. She was 91. A disc of orchestral music by Kenneth Fuchs, the new head of the music department, has garnered two Grammy Award nominations.